Way back when I was young, my parents temporarily rented a house originally built in the late 50s/early 60s, that still contained an original 1960s pink and black bathroom. 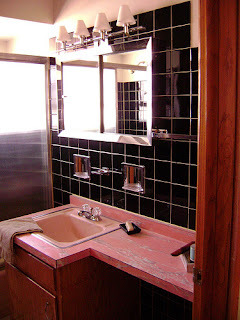 Of course, I regret now the fact that we don't appear to have a single photo of that bathroom, as it really was a classic - in excellent condition too. Since then I've been scouring the web to find something similar, and this is the closest I have come; just amazing.